This is not a pipe. 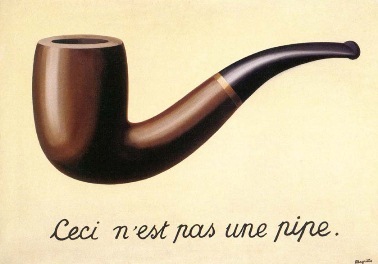 This is an altered, scanned image of a painting of a pipe. Humans cannot grasp unfamiliar concepts without the aid of analogies, at least in the beginning. Such is the limitation of our understanding. But analogies have their own limitations; for the map is not the territory it represents, and most analogies are not constructed with the care and accuracy of cartography. Nevertheless, the map is often easier to comprehend than the vastness of the territory, and people tend to cling to analogies long after they cease to remain useful. This can have disastrous consequences, especially when the concept in question is a deity. Some deities began as personifications of forces of nature. Others began as tutelary deities of a particular tribe/location. By giving name and form to impersonal phenomena, people could not only relate to them better, but they could attempt to control said phenomena through prayer, threats or bargaining. Then people started weaving stories around these entities, and added more allegory and legend and what not. As time progressed, the original phenomena became less relevant, and the sentient characters created to represent them became idols in their own right. People's goals shifted from survival to salvation. And their deities evolved to fulfil these new needs. This is not a moon. This… is complicated. Now one layer of allegory/analogy of dubious quality can be difficult enough. Imagine trying to make sense of several layers of such analogy, sandwiched between vested interest and dissonant values. That's exactly what ancient deities are to modern eyes. And this, is the Divine Paradox. The general consensus points to an allegorical explanation. The general consensus points to those specific allegorical explanations. The fact that allegory as a device relies on public consensus does not in itself make it a bad tool for communication. An effective allegory, however, is one which is recognisable, whose context endures the physical death of the author, and whose underlying analogy remains relevant/valid to readers across space and time. I would like to hear about the migration of deities across subcontinents, like saraswati was travelled to Japan, morphing into Benzaiten.